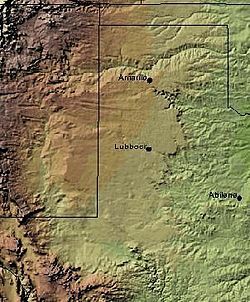 The Llano Estacado lies at the southern end of the Western High Plains ecoregion of the Great Plains of North America; it is part of what was once called the Great American Desert. The Canadian River forms the Llano's northern boundary, separating it from the rest of the High Plains. To the east, the Caprock Escarpment, a precipitous cliff about 300 feet (100 m) high, lies between the Llano and the red Permian plains of Texas; while to the west, the Mescalero Escarpment demarcates the eastern edge of the Pecos River valley. The Llano has no natural southern boundary, instead blending into the Edwards Plateau near Big Spring, Texas. This geographic area stretches about 250 miles (400 km) north to south, and 150 miles (240 km) east to west, a total area of some 37,500 square miles (97,000 km2), larger than Indiana and 12 other states. It covers all or part of 33 Texas counties and four New Mexico counties. Some years, a National Weather Service dust storm warning is issued in parts of Texas due to a dust storm originating from the area or from the adjacent lower part of the Southwestern Tablelands ecological region. The landscape is dotted by numerous small playa lakes, depressions that seasonally fill with water and provide habitat for waterfowl. The Llano Estacado has a "cold semiarid" climate (Köppen BSk), characterized by long, hot summers and cold winters. Rainfall is relatively low; the entire region receives fewer than 23 in (580 mm) of rainfall annually, and the western part receives as little as 14 in (360 mm). High summer temperatures (average July temperature above 90 °F or 32 °C) mean most of the small amount of precipitation is lost to evaporation, making dryland farming difficult. Several interstate highways serve the Llano Estacado. 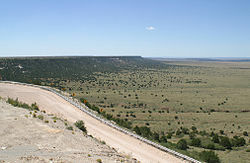 Interstate 40 crosses the northern portion from east of Amarillo to Tucumcari, New Mexico. Interstate 27 runs north-south between Amarillo and Lubbock, while Interstate 20 passes through the southern portion of the Llano Estacado west of Midland and Odessa. Rachel Plummer, while a captive of the Comanche in 1836, mentioned the "table lands between Austin and Santa Fe". When we were upon the high table-land, a view presented itself as boundless as the ocean. Not a tree, shrub, or any other object, either animate or inanimate, relieved the dreary monotony of the prospect; it was a vast-illimitable expanse of desert prairie . ... the great Sahara of North America. it is a region almost as vast and trackless as the ocean—a land where no man, either savage or civilized permanently abides ... a treeless, desolate waste of uninhabitable solitude, which always has been, and must continue uninhabited forever. Herman Lehmann was captured by the Apache in 1870 and described the Llano Estacado as "the country was open, but not exactly a desert". Robert G. Carter described it in 1871 while pursuing Quanah Parker with Ranald S. Mackenzie, "... all were over and out of the canyon upon what appeared to be a vast, almost illimitable expanse of prairie. As far as the eye could reach, not a bush or tree, a twig or stone, not an object of any kind or a living thing, was in sight. It stretched out before us-one uninterrupted plain, only to be compared to the ocean in its vastness." In August 1872, Mackenzie was the first to successfully lead troops across the Staked Plains preparatory to the Battle of the North Fork of the Red River. William "Billy" Dixon, described the area while buffalo hunting in June, 1874, "All of us hunters acquainted with the habits of the buffalo knew that the herds would soon be coming north from the Staked Plains region where they had spent the winter ... moved by that strange impulse that ... caused them to change their home and blacken the Plains with their countless, moving forms." In the latter part of the 19th century, the Llano was a refuge for the bands of Kiowas and Comanches who did not wish to be confined to reservations in Indian Territory, in present-day Oklahoma. One of their last battles against the US Army was fought on 28 September 1874 in the Battle of Palo Duro Canyon. Charles Goodnight in describing what it takes to be a scout, "... the trained ear should be able to tell the sound, whether it was made by man or beast or bird ... as a human voice echoes more than all others ... of course, on the Staked Plains we have not this advantage as there is nothing to create an echo." Notable lawmakers include George H. Mahon, Kent Hance, and Robert L. Duncan. The area has a large number of churches per capita. Lubbock, known for a wide variety of denominations, also holds the distinction of being the most populous city on the High Plains from the Dakotas through Texas. Prohibition did not end on the Texas Plains in 1933 with repeal of the Eighteenth Amendment to the United States Constitution, but continued for years at the county level. Even in 2010, some forty Texas counties, most in the Llano Estacado, remain officially "dry" to the sale of alcoholic beverages. The economy of the Llano Estacado is predominantly agricultural, with farming of various crops prevalent, as is cattle ranching. Oil and gas production is also prevalent on the Llano Estacado. One of the largest economic drivers on the Llano Estacado is in energy production, with the region experiencing significant activity for producing oil and natural gas associated with the Permian Basin. Additionally, wind farms have proliferated on the Llano Estacado due to the region's windy climate making it a favorable location for the production of wind energy. Empire of the Summer Moon: Quanah Parker and the Rise and Fall of the Comanches, The Most Powerful Indian Tribe in History (2010) by S.C. Gwynne. The Llano Estacado figures prominently in the narrative. The movie No Country for Old Men directed by the Coen brothers was shot primarily in this region. Roger Deakins was nominated for the Academy Award for best cinematography for this movie. Outdoor shots show us the extensive beauty of the Llano Estacado landscape. The film Hell or High Water (film) (2016) was shot in this region. Carry Me (2016) by Peter Behrens (writer). In Fred Gipson's 1962 children's novel Savage Sam during the search for "Little Arliss"
^ a b c d e f g Art Leatherwood. "Llano Estacado". Handbook of Texas Online. Retrieved 28 October 2007. ^ What Does "Llano Estacado" Mean? About.com, 2010-05-12. ^ "Texas Conservation Action Plan Ecoregions" (pdf). As depicted by the southern half of the High Plains--in conjunction with a aerial map of the region: Texas Parks and Wildlife Department. 20 May 2011. Retrieved 1 October 2013. ^ "Ecoregions of Texas" (pdf). As depicted by items 25i,25j,25k on the map in conjunction with a county names map: U.S. Geological Survey. Retrieved 1 October 2013. ^ Playa Lakes United States Environmental Protection Agency. Retrieved: 2012-10-15.